'Go to sleep, darlings, till the summer comes again.'" I wonder, as winter digs in her heels, how I'd live the season differently if I were a tree. If my only "work" right now was to rest. If I knew that I was planted right where I belonged. Nothing to hurry towards, no expectation of bloom or fruit. I think I would know that, in this season of shorter days and long, frigid nights, all that was needed was the gathering of strength. And I'd be glad that, as my branches await the longer, warmer, sunnier days to come, my roots can continue to grow in the blanketed earth. The earth that is kept warm. That does not freeze because of the snow that continues to fall. As I began this year, I chose "tree" as my inspirational word. So I've been watching them closely...and happen to love this time of year when only branches decorate the sky line. I said to my brother the other day that it's not the snow that is a bother...it's that we all insist on plowing right through it and getting on with our "normal" routines. It's so hard to close down, stay in, quiet down and rest. I can be like a toddler who is too busy to be bothered with a nap. Fighting rest, fighting a change of pace. Resisting the quiet. Now, I know I'm not a tree. And school, work, travel, fresh air and grocery shopping will continue to be a part of who we all are - even in the dead of winter. But I'm going to take a hint from the trees, and try not to rush the season. I'm going to head outside during today's snowfall and listen to the quiet. I'm going to leave work early if the roads show signs of worsening...and not worry about loosing a few bucks. And, when I wake up tomorrow the sky will be bright blue, the storm will have passed and "my" branches will be snow kissed yet again. Sure...there's part of me (the cold part!) that feels ready for the spring. 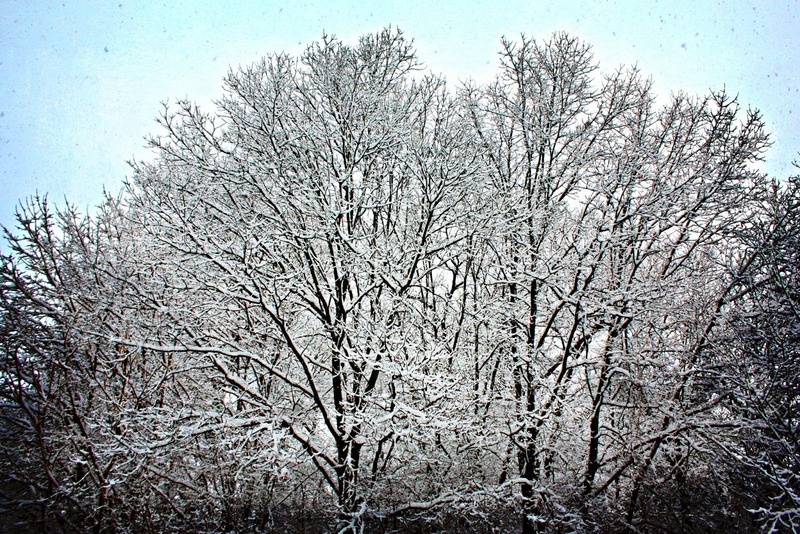 But I'm going snuggle up under my soft, white blanket...and wait patiently along with the trees. I agree, I too love the bare branches of the trees...and I love your words here today, so very good! Love that first image! Ready or not...here we go again! What a great attitude . . . the snow has been driving me insane. i love your images today adrienne. i adore the way the snow hugs every single branch of every single tree!! I love this :) I think you missed this post called my tree...http://asunkissedlife-ayala.blogspot.com/2014/02/my-tree_4.html I think you will enjoy it. Take your time and enjoy the season for it too shall pass. Wonderful way to look at snow. I do not miss having to shovel it, but I do miss hearing the snow fall. Right where my head has been... Except I have been doing more wishing than waiting. Oh to be a tree. You write so beautifully. Your post inspires me to be more still. I love that your word for this year is "tree." I've never heard of someone choosing that word, but it makes sense to focus on trees and reflect about life. You gave me lots to think about!